With the introduction of Insta Loan and other products, taking a quick loan on your Hdfc Credit Card is damn easy. Hdfc has made the approval process super simple that if you have a pre-qualified offer, you can get the loan amount into your account in matter of seconds, no documentation required. There are different variants of loan. Let me explain them in detail as bank doesn’t make it clear for unknown reasons. 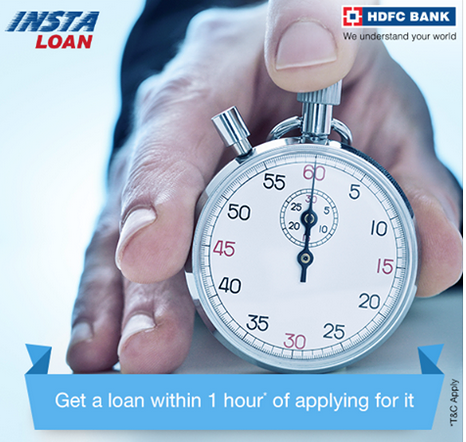 If eligible, you can get Insta Loan (aka Cash on Call) on your credit card in matter of minutes through net banking. The given loan amount will be blocked against your credit limit and you can pay the loan in flexible tenures as EMI. It is similar to Insta loan but your credit limit doesn’t get blocked in this case. This loan will be billed separately with Auto Debit enabled to your linked savings ac and not charged on your credit card statement. As far as i can understand, Insta Jumbo Loan is a kind of “Personal Loan” given to you on basis of credit card usage. Related: Need more details on HDFC Insta Jumbo Loan? check out Insights into Insta Jumbo Loan. You can convert your credit card expenses into EMI. You can convert one txn or many at a time. Process is quick and easy through net banking. So you would ask, which one should I go for?! Whichever has the low interest. If you’re looking for a higher amount, Insta Jumbo loan is better as this wont block your limit. You can also choose smart EMI or insta loan based on your spending type. Note that only Smart EMI has lowest EMI period: 3 months. At times, Hdfc runs offers wherein you can get loan @ 11.88% (annually) with processing fee waived off. It’s super cheap and you can never get such interest rates with unsecured loans. My dad was once lucky enough to get Insta Loan for 50k INR during the offer period. His credit limit was 1L at that time. Check your net banking once in a while to see if there are any offers on your credit card. Apart from interest rates, note that you also need to pay 3% foreclosure charges if you decide to close before the EMI ends. Apart from the interest rates, note that the eligible loan amount varies from customer to customer and depends on Hdfc internal policies. I’ve spent a lot on my credit card but I never got any loan offers. But my dad spends too less on his credit card but got a good offer and he availed. Though we both have different cards with different spend types. Looks like the card variant and the customer profile matters to bank. Have you availed any Credit card loans earlier? Share your comments below. I have credit limit of 30K and outstanding is 24456 and I have taken instant loan of 14000 and am paying it on time evry month and now am ready to pay my full outstanding amount in single shot . Please suggest will I get jumbo loan after clearing of all outstanding amount and how much loan I will get in jumbo loan. Naveen, there is a pre-closure charge. Do the math for your outstanding if its better to pre-close the loan or not. 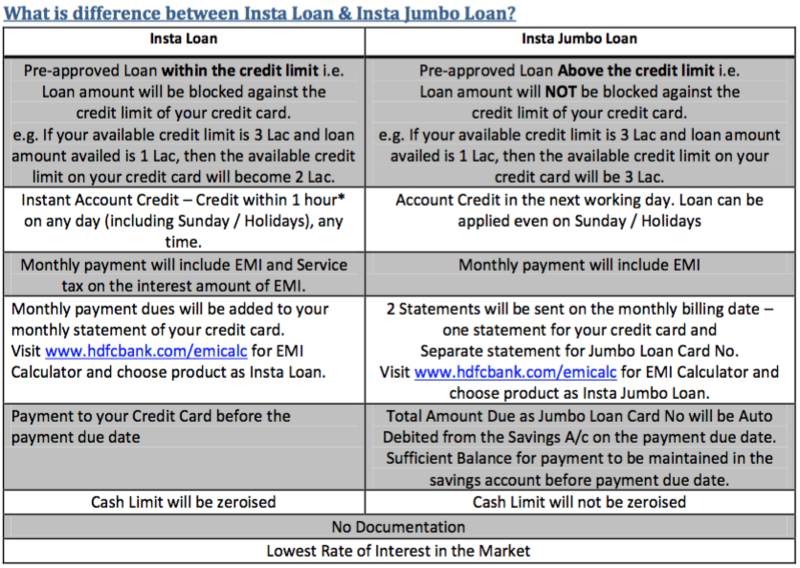 You can expect Insta Jumbo loan eligibility if you have salary a/c with HDFC or have the card for longer duration. Hi I have credit card last yr I have a offer for jumbo loan but now a days there is no offer what should I do for that please let me know soon.. They keep changing the offers every month and customers have no control on it. You simply have to wait and watch. I have a HDFC Salary account & also Titanium edge credit card. I would like to avail for Insta Jumbo Loan, but for me its showing not eligible for it. Can u pls tell me how to avail it. Your information on HDFC CC loans was fabulous and I have Times Card with 1000 reward points can I get cash back with my reward points ?? They auto debit from your savings account for “jumbo loan”. You need to maintain the balance in your linked savings account for the same. Can you please guide me how can i pay the monthly emi for jumbo loan. I don’t have any hdfc savings account.? You have to setup ECS i guess. Recently i got an option to upgrade my women’s solitaire card to visa sig money back card or visa sig all miles card… usually i dont travel much but i am a shoppingfreak online and offline both…. HDFC Visa Signature Allmiles is good for such combination of Online/offline usage. You save around 1.5% as points on all spends. i have taken hdfc credit card recently(15days). and i have purchased around 9000 worth things now and then. my bill generating date is 13th this month. now im planning to convert this 9000 as emi’s. but net banking saying that im not eligible to convert it to emi’s. how long i suppose to wait to avail that option. EMI offer on HDFC Cards is not a standard feature and will keep changing every month. So you got to check every month before you charge on the card. I have offer for insta loan from hdfc bank on my HDFC times titanium card for 74000/- @11.88p.a. How sure i can be regarding the offer stands same as per provided by call center person and if it does not then can i cancel the offer availed. If you see this 11.88% offer on your a/c and if you’re in need of cash. Just go for it immediately. These are short term offers. This interest rate is the lowest in the country as i’ve already mentioned. If I avail Insta Jumbo Loan, am I eligible for Insta Loan? Yes, you are, but depends on the availability of the offer on your card. Hello i need to know whether we have to have account in HDFC bank for taking the insta jumbo loan. I believe so. However, pl ask bank. You don’t have to hold a savings bank account for any kind of loan a/c relationship with bank however as it’s an offer on Credit card you should have one and as Siddharth mentioned above it should generate offer on your card which is quite unpredictable. I got a call from HdFc but I dont have a hdfc credit card. Is it available also for HDFC debit cards?? I had install loan offer till last month but this is not available right now what I should do to get it soon? You cant do anything Nitesh. You simply need to wait until next refresh. Is this loan available for new credit cards? As in I received my credit card few days back. So am I eligible for this loans?? Check the availability from your netbanking. Its just few clicks away. I got a insta loan for 2.5lacs for 11.8%, i paid my first emi. Now i need 9 las, so i tought of going PL. Wil the bank take over the insta loan wit PL as balance transf. Or need to preclose this with PL amount. Which is best. pls advise. Insta loan is a loan on CC. PL is completely different and its not that easy to get 9L generally. Its interest rate is also very high. Thanks for the info Siddharth. This might change the comparison above? I got Insta Jumbo loan from HDFC on Feb 2015. Now I would like to close it. Could you tell me is there any preclosing charges for Insta Jumbo loan? If so how much it is? They keep changing policies often, Check with Customer care before you close it. I need to instant jumbo loan very urgently basic hdfc bank plz help me bcz I am already hdfc bank savings account & credit card to limit 42k thousand. I have 5 Lakhs Insta Jumbo loan on my card. I have requested my card settlement. They have approved the settlement request. Please confirm what will happen to Jumbo loan. All due amount will get debited from my saving account in one shorts or Jumbo loan due amount will also be part of full and final card settlement amount. Please help me with your expertise. Generally you have to settle all loans/dues etc if you’re planning to close the card. It seems that you are very informative in these regards which only comes with experience, so I thought it would be great if I post my query on loans here. I have Credit card , savings account with HDFC Bank ( optional ) and salary a/c with Axis Bank. 1. My cc limit is 1L and I need 1.5 lakhs loan on CC , does the loan amount depend on limit. yes if loan facility is available on your credit card they will give loan ,but below 1 lac you can check it through your net banking . HI, I want to know the process of pre-closing the Insta Loan on my CC. I can’t find anything online. Do I need to visit the branch ? thnx. Simply call-up customer care for the same. I want to know how much time taken to credit loan amount in savings account after applying insta loan? but amount not credited in savings account immediately. If the offers avail on your Card, yes you can. hi siddharth how r u i hold a regalia credit card with 3l limit and i have decent credit history with hdfc bank from last four years and my crd usage is very low like 2-4% of credit limit i requested bank many time to raise my limit but they always reply that your usage is so less so this month bank gave me insta loan offer for 2.5l and simultaneously also give sane amount jumbo loan offer also but i no need for funds but to show credit card usage i take 2.5l insta loan today so my question is that is this loan show usage of card to bank for consider for my limit increase. But i wonder why do you need more limit when u use only 2%? Loans on card would help, but more purchases in long run will definitely do. Convert to EMi if possible. Else transfer to different bank card and make it as EMI there. Using Balance transfer Option you can do it, but that’s a low limit on ICICI. Sadly not possible. Okie…..what are the consequences of not paying apart from cibil ?? Interest charges will be high and they will send collection agency after sometime finally. I have also the same card HDFC moneyback credit card.Is there any facilities available for emi.If available then how to do.Bcz I have already called customer care.Butvthey people don’t aware of the process& told that No EMI facilities available on any HDFC credit card.Really ridiculous people sitting over customer care. varies from card to card. Check your netbanking. It depends on your Usage, limits & repayment history. For limit enhancement, you can request along with your IT papers. 1.if any bank cards are not charging service tax on emi. No. Only personal loans don’t carry ST component. hi sidarth, u hav lot of knowledge of credit card . i have hdfc allmiles cc limit is 1lac.last week i got a insta loan of 75000. but yesterday i got offr of jumbo loan 125000. bt i do .should i take jumbo loan or prepay instaloan. Doing prepay will charge you 3% preclosure fee. If you need the funds and if you’re fine in paying the fee, yes you can. Hi, Unkonwingly failed to maintain the min balance for auto debit. Fund the a/c for the same and ask CC guys to debit it. You might be charged some fees for this reversal. hi just i received the credit card of 75000/- credit limit…. the pin not yet sent is pin want to generate online with net banking but there also the card need registeration…. did i request pin through phone banking or shall i wait for pin courier? Call phone banking to register your card to your a/c if not done. then you can generate OTP for pin change. i taken 2 laks insta loan and 5 lakhs jumbo loan from hdfc….. im paying emis regularly from lost year no more dues..my query is now im planning for housing loan is this amount will minus in eligibility in my housing loan or else that is not effect….. according to that i wil plan further…..
Hi .. does it mean that availing the insta loan & insta jumbo loan will not have any affect my cibil score? What is the difference between cibil score & credit score? I have Hdfc money back card .I used in shopping 21300 ,I called customer care to convert emi ,that customer care people told me there is no emi on “money back credit card ” what I want do now? only some cards have EMI option. check if you have other loans available. Else you have no other option other than paying in full. I had taken Insta jumbo loan on HDFC credit card for 24 months period.But I want to close it now(6 months completed) . Can you please explain with example how much I need to pay total amount amount with 3%. 3% on Remaining principle. You ahve to ask bank for the exact numbers. Hi, I have taken Insta Jumbo loan on HDFC CC. It was closed yesterday(paid all installments). When Can I take new Insta Jumbo loan on same card. ( I already have Install on that same card). Yes, possible. However depends on whether offer is available or not. Usually it will refresh after 1 month. hello i have moneyback credit card. but it show not currently valid for EMI. The terms and conditions for the loan says Service Tax is applicable for Jumbo Loan. Please check. I like your information on HDFC bank credit card. I am using HDFC Business credit card and limit is Rs.25K from last 15 months. My issues are with this card, They are NOT offering me Insta Loan, EMI, Jumbo Loan, BT, Credit enhancement etc. Bank denied to to give theses facilities due to low internal credit score which is around 500. They told me I have to make full payment rather than Minimum Due. I made mostly minimum due payments however all payments was in time. I am very shocked that I am paying huge interest to bank but they are not offering me facilities. I thought Bank is making money from me in the form of big interest instead of ZERO interest if paid fully on due date. Is this valid point from Bank? If it looks right then why bank is giving minimum due option they must must be close this facility as it looks like a HONEY TRAP. They are taking huge interest but don’t want to offer facilities like EMI. In past my situation was not good. I request them to covert my total due amount into EMIs but they denied. HDFC bank is only bank who don’t have EMI facility as standard with card. I have ICICI bank card with 75K limit and offered me EMIs if amount is more than Rs.3000 of any transactions. There is no requirement of any eligibility like HDFC Bank credit card. I think EMIs is not big deal for any bank if they can sanction the limit of card. It’s not new loan application. its just a adjustment with credit card billing in given credit limit. But don’t want to understand this thing. However HDFC bank helped me in emergency and they enhance my card limit by Rs.12000 for temporary. I really appreciate hdfc bank employee Miss NITI who helped me in this. I thanked to her. I am self employed and currently not using card limit of this card from 2 months. Hoping for Insta and jumbo loan offer on my card ? Would you please help me HDFC bank is giving Insta and Jumbo loan only to SALARIED person? How can I make good score with hdfc bank card. However my CIBIL score is 768 and I never missed a single payments in last 3 years. My credit card usage is too high due business activities. So looking for good credit limit. So I can avoid to make usage more than limit or under 70% of the limit. So please guide best possible to option. Always, pay on Full, and use the card for Online shopping at times for EMi and other offers to be enabled on the card. Hi Siddharth. I have availed insta jumbo loan of 50k. However I had insta jumbo loan approval of 4 lakh. So my question is can avail the remaining amount later when i need it. Only 1 insta Jumbo loan can be availed at a time. So you can avail more once you close 50k loan. I Got Hdfc Money Back credit card 2days back! I want To get Insta Loan With EMI opptions. Am I eligible for this? And I Do Have salary acc on same hdfc! You need to wait for sometime for the eligibility to kick in. Keep checking the internet banking for the Insta Loan offers. hello sir, i have availed a insta jumbo loan of 1.90k , but to pay back i dont have a hdfc savings bank account , so, whats are the other ways to pay my jumbo loan EMI . to make online payment , the jumbo loan card number is not given by the hdfc, they have just provided the jumbo loan account number in the statement which was sent through mail. cna u please help me . Call HDFC Customer Care. I think u can setup ECS or simply do NEFT to that a/c no, like any other card. Hi Siddhartha, for me I have 290000 insta jumbo loan limit and has 11.88 percent of interest rate. My question is does the interest rate is floating or fixed? Also which one is the best loan if we compare with insta loan vs personal loan vs instance jumbo loan..
As per my knowledge in personal loan interest rate decreases gradually once we start pay the emi’s. I.e., they charge the interest only to the balance emi amount once we start paying. Its a Fixed interest rate on a reducing balance(principle). Jumbo Loan is best as there is no Service tax component in it. Its considered as a Personal loan and it will be reported to CIBIL separately. I have Doub on this, Is there any other hidden chargers applied here, other than EMI mentioned amount. On this it is not calculated 14.4% interest correct? Please do let me clarify. I confused much. 2,31,369.84 is the interest for the said period. But unfortunately i have missed this insta jumbo loan. Till last month nov end. Its available. But now, it is unavailable. I called phone banking, they also said the same. It is a limited period offer :(. So planning to go for personal loan. Thank u so much guys, itvis very informative one i am clear now out of confusion. But my insta jumbo loan got expired. Because its a limited period offer. I called phone banking and confirm the same. Personal Loan has high interest rates Faruk. I took the Insta Jumbo Loan 2 lakhs for 2 years and Feb 2017 is the last EMI for it and my account is now in the preferred customer criteria. and its the salaried account. My query here is once I paid the last EMI, may I able to get the Insta Jumbo loan again on Feb or Mar 2017? If I am able to get, what is the minimum and maximum amount that I can expect? FYI, you have mentioned in your replies that HDFC bank changes offers time to time and I accept it. But, I need to know about my above concern. Please reply. Most likely you’ll get eligibility for Jumbo loan again with higher amount. Thanks for your response Siddharth. I appreciate your replies for the queries asked and the time you spent to answer those queries. Keep continue this to help the people regarding the banking. Could you please arrange exact eligibility criteria for insta jumbo loan offer from Hdfc internal team? I’m using card from last 18 months but none offer is available. Even I changed my card for this reason but nothing is happening in favor me. I request you please find out exact eligibility criteria. I always made timely payments. If we can get the system eligibility requirements then. We can try to follow. I think bank should disclose this. It will save time and efforts. Thanks for your help. please let’s know when secret will available on your blog. please inform us. I have HDFC CC for the past 14 years and have been using regularly. Recently my status changed to NRI and my savings account got converted to NRO and connected my new NRE account to the same existing account. I continue to use the credit card as well. Now, I have a question. I have a few payments to be made back home and want to avail Insta Jumbo loan. In my netbanking, I get the details for Insta Jumbo loan and the offer. Will this be credited to my NRO account if I avail? Please confirm. No idea on NRI accounts. But typically it has to get credited to the linked “savings” a/c. My mother already have a two wheeler loan in hdfc bank and she is paying it regularly and the tenor will complete this april, and am planning to take a bike loan from hdfc aswell so can i get instant approval as my mother is already taken a loan (am planning to take the bike in my mothers name). Yes, you should be able to get it. I’ve recently found this secret eligibility criteria and i’ll be writing on this soon. Waiting for the secret to be revealed. Its already published. Please check out the link in last para of the article. Wow.. thanks for your information, but your “Service tax” info was not clear … So I tried to calculate my EMI for an x amount in both Insta and jumbo loan… (PS.i have a Insta jumbo loan of 615000 in my wife’s titanium credit card, lucky me).. for same amount and same tenure…. both Insta and Jumbo shows same EMI…. can you please explain where my understanding going wrong? SBI SimplyClick is good for online spending. Further to my previous question i am also not getting any encash offer from SBI CC card though i have been using it extensively for more than two years now. My current usage is almost 90% of credit limit is it because of that. 30% is the good utilization ratio. 90% is too high. I had recently operated/ surgery to my new born child and pay much more for it. Now I am short of money. I am ready for paying money via emi as my previous outstanding balance are bill. What to do. Kindly guide me. Tough time. Try taking insta & insta Jumbo loan if available. I had insta jumbo eligibility in my card before 3 days. Since I had 1.37Lakhs of outsanding in my credit card, I thought I can use Insta jumbo loan offer. But when i check now i find that the offer is not available. I checked with the bank also. They said the same. Could you pls help me suggesting any similar product as 1.2% ROI as Insta jumbo loan, not higher ROI than this ? HDFC has the best ROI. You need to check YES bank cards for similar ROI. I was eligible for 1.8L jumbo loan and appled for it.I cancelled it due to other reasons the next day.. now when again i tried to apply it is showing as 0 amount in netbanking site. Can i apply again within the offer period. Or the offer got elapsed..
You might need to wait for sometime for it to be enabled again. I took insta jumbo loan of amount 3L by 2015 for 5 yrs tenure.. is there possibilities to get offer for another jumbo loan while existing one is still not closed. . Sadly only one jumbo loan is allowed at a time. I have taken a Jumbo loan recently. I see another jumbo loan offer on the same card (Old loan is not closed yet.). I believe it will be treated as a top up of existing loan. They clearly say that only one Jumbo loan can be availed at a time. Though, yes, you can give it a try. Thank hari. Need one more clarification. I took jumbo loan in platinum plus card which has been expired and now I got regalia first card recently. Will I get jumbo loan offer now or loan will be available only 1 yr later.. It was showing same on my HDFC Regalia. Even though, it’ll show you that you can take another Jumbo loan on the website. But, when you’ll try to apply for that loan the website will not allow you to proceed further. I tried it. Got the second jumbo loan on the same card credited to my account. Technically its setup as another credit card. So you can do NEFT to it like any other credit card payment. However test with small amount to be sure. My credid card limid 35000. If I cash widwol 30000 .bank pay date.. I have purchased HDFC freedom credit and using from the last 4 months. Still I am looking for Insta Loan or Instant jumbo loan but always throws not eligible at this time with one Notify Me button. Even I have clicked that button more times. Till not getting any call from the bank or that option. Can you plz suggest me to get this offers immediately. I have hdfc solitaire credit card and using for last two months. When I was tried to select smart Emi option it is showing not eligible for u. Is it any eligible needed for apply smart Emi. And also I can’t able to select statement on email. That also shows error.contact customer care.how to resolve this issues. I am have a salary a/c with HDFC and their jet privilege and diners club rewards cards. Both these cards have 75k limits. Recently I acquired a credit bill of around 51k which I plan to pay in 3 months i.e. around 17K per month. I can even finish them up earlier if I have some cash flow from other sources. Now my question is that Smart EMI is giving me the 9 months option followed by 12.24 & 36 months at 18, 15,15 &15 % respectively. I also have a pre-approved personal loan at 15% that i can take for 1 year but I want to pay the amount back quickly and got done with it. What are my options and the best and economical way to go about it? which card provide free balance transfer for say 3 months? There is none AFAIK. You got to pay the interest. Processing fee is the only thing whch is waived. i have Smart EMI on my credit card till 2 August 2019 and now wants to close it. can it possible before 2019? please reply. Insta Loan . Insta Jumbo loan not attractive any more , now HDFC offer this type of lone on high interest rate of 15% to 16% , why interest rate going up with hdfc when other bank reducing interest rate. But you’ve availed on 2 different cards, which is possible. BTW, was that 9.25L Jumbo loan on a card with 75k limit? You can avail two jumbo loans on the same card as long as they are available. I have availed twice on my Regalia in a span of 3 months. Siddarth, I have availed the Jumbo loan for the third time on the same card and the previous 2 jumbo loans are still active. So, when they say only 2 Jumbo loans can be availed at any time, it could mean one jumbo loan each on 2 different cards. Yes, i’m noticing this as well. 2nd Jumbo loan is getting enabled after couple of EMI’s on first jumbo loan. Or, they could have tweaked even further in recent times. Yes it’s true. I availed Rs.9,25,000/- Insta jumbo loan on my Regalia First CC ( CL is 75000/- ). Even I too coudn’t believe it initially and I was surprised to know it. But, it’s true. You can avail two jumbo loans on the same card with a gap of 2/3 months. Is it true that they charge GST on the interest part of the EMI? If yes, this is a very bad deal right? There were no other charges. I have a credit card with limit of 75k .Can i use to buy bike?I just wanted to know monthly EMI for that 75k. Unbelievable changes are happening with my CC I.e credit limit enhancement from Rs.75000/- to Rs.475000/-( four lakhs seventy five thousand). I don’t know exactly what triggerd for that. 7) I’m a classic account holder of HDFC. 75k to 4.75L – Wonderful! I’ve got mine doubled, but never seen such huge move of 6X, does this happen as auto LE? Lots of congratulations. This is a miracle. I never got automatic LE even once since 2 years of holding the card. Let us know if you get more offers in future. Yes, it was an auto limit enhancement. I never asked for LE because I don’t meet their eligibility criteria. Can I go for Yes first or IndusInd Iconia or any other card based on the card on Card? 1. Regalia for sure you can get. DCB i doubt. Small info regarding Insta Loan of Hdfc. Insta Loan interest varies from profile to profile. E.g: My net banking shows Insta Loan with the ROI of 15%. (earlier it was 13.8%) whereas my brother’s is 13.8%. What exactly is “PROMO CODE”, which is asked when applying Insta Loan through net banking, Is it useful for us the customers? Although it is mentioned “Optional” but curious to know if we are missing any benefit by not entering anything there. Please clarify. thank you! can yu get insta loan offers on secured card? I would like to take insta jumbo loans, I don’t have any credit card right now. I’ll apply for credit Card. Can someone tell me, once I got credit card , am I eligible to take insta jumbo loan or do I need to wait for some month. And I want to know, Insta jumbo loans is available now?. and please let tell me about the service tax and disadvantages also. I agree HDFC Insta Jumbo Loan is the best. I had even got the offer of 10.68% p.a. once in 2014 and I took it for first time for my father. I booked another loan just after it was over for something i needed but this time it was with 13.80% p.a. I want to pre-closure my HDFC Insta Loan. Please suggest me how to close that. Please call the costumer care and request for the same, they would tell you how much to pay including preclosure charges, once you transfer that to your credit card account your loan gets closed. Beware that you will have to incur Pre-closure charges ! Just call CC customer care and inform about preclosure. They will then and there calculate the total amount ie. Outstanding amount + Preclosure charges + GST and inform you about the total amount to be paid. This amount you can pay by the due date of your CC payment. Thats all ! All loans will turn out very expensive due to GST on interest. This is sheer loot which no one is talking about? Except for jumbo loan, it was there earlier too, as Service tax. I am using hdfc credit card in last 3 years. my current limit is 1,30,00 rs, and I am eligible for 1,60,000 rs insta jumbo loan. If I applied 50,000 rs for 12 months the emi will be 4541rs/month, total 54,492(including interest). Imagine in April I took 50,000 rs like that way and i pay 2 EMI (May & June). In july I got a bonus from my company, so I wanted to close my loan. Whats the process for that.. I am paying only the balance amount or interest also? any additional charges is there for that situation? Hope your detailed reply regarding this. Thank You. Is cibil show I am using more credit ? utilization ratio ? Yes, the rates are so high these days. Re-written the entire article. Hope it helps. HDFC cards do not report total credit limit, hence as per latest TU formula are not used when utilisation % is calculated for your CIBIL score. Only cards that report total credit limit are used in that calculation. Yet they use “high credit” value to get an idea on the Credit limit. I have Concern about Jumbo Loan. 1. my concern is any hidden charges if i get jumbo loan. 2. EMI is Constant as per EMI Calculator Included GST.